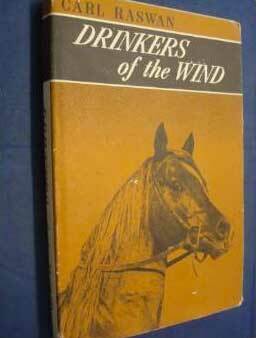 Orginally published in the 1930's or 1942, Drinkers of the Wind is a delightful story of Raswan's travels in bedouin Arabia in search of the perfect horse. Carl Reinhard Raswan, born Carl Reinhard Schmidt, was one of the greatest connoisseurs and patrons of the purebred Arabian horse. He authored numerous books on Arabian horses and the Bedouin people who raised them. A scholar of Arabian bloodlines, he also published the Raswan Index, an extensive compilation of Arabian horse pedigree and strain information. He advocated tolerance and understanding of Bedouin ways of life and culture in Arabia. Ten years ago I made a conscious decision to live my life outside of my comfort zone. I had held in my grasp for a fleeting few seconds the feeling that I could do the things I thought were impossible, and it was intoxicating. It was the start of a lifelong adventure which has taken me to the jungles of Papua New Guinea, the sand dunes of the Moroccan Sahara, the remote outback of Australia, up and over the unforgiving hills of the Comrades marathon in South Africa, over staggering altitudes in the Rockies, swimming six miles in the ocean off Hawaii and now riding five back-to-back 50 mile days on horseback in Utah. Over the years as I pushed and explored the boundaries of my comfort zone, or discomfort zone, as I came to know it, I developed a philosophy I called More Than The Finish Line, which effectively focused on my journey, allowing me to live outside of my comfort zone but in a way that made sense of the setbacks and managed my expectations. It allowed me to let go of finish lines and showed me the value and the joy of the journey. When I look back 15 years I could never have imagined that I would be where I am now, a South Africa-born naturalized Australian, living in the Coloradan Rockies on acreage with horses and dogs and plenty of local wildlife, riding the trails on horseback and working for a not-for-profit that encourages kids to get off the couch and outside. When my wife Kirsten and I married in October 1999, I weighed a hefty 253 pounds, all of which I attributed to my Rugby Union-playing background, and the requirement to stop a charging athlete dead in his tracks. Over the past 15 years I have spent all of my energy and focus on trying to become as efficient as possible over long distance. Being a bigger-framed 6’3” athlete, I have always found that longer, harder and tougher has tended to suit me, by bringing everyone back to a level playing field. Over the years I have competed at the highest level in Ironman Triathlon, run a multi-day race across the Moroccan Sahara desert and run competitively at the half-marathon, marathon, ultra distances. In 2010 I was fortunate enough to cross the finish line first at the Ultraman World Championships in Hawaii, a 3-day endurance triathlon with a 6.2 mile swim, 261.4 mile bike ride and 52.4 mile run. Afterwards, I decided that I had spent a long career in triathlon, and that it was time to pursue something different. At the time I was working for a global engineering firm in Australia while studying to be a coach and personal trainer. To “walk the talk” I needed to follow my passions in life and get out from behind a desk. In 2011 my focus became on gaining qualification status for the Badwater Ultramarathon in Death Valley. To do this I was required to run three 100 mile events, one of which needed to be within 12 months of my application. Never having run 100 miles, this was going to my year of wading through the races. In my third 100 mile race in Australia I ran the country's fastest-ever time for 100 miles on trail: 15 hours and 37 minutes. As the year drew to a close I had achieved my criteria for qualifying for Badwater – now all I had to do was wait until February to apply. In the December of 2011 I thought that I would put my name in the lottery for the Western States 100 mile endurance run. This was before the Badwater application but I figured that in a lottery my chances were not that great of getting accepted. As it turns out I was given a special consideration spot as an international, the only Australian entrant accepted. There went my plans for Badwater, but more excitingly I was going to run the “grandfather” of 100 milers and follow in the footsteps of ultrarunning greats. Thinking, “How do I get further out of my comfort zone?” following my acceptance, I applied for and was granted entry to race in the “Grand Slam of Ultrarunning.” The Slam consists of the four oldest 100 milers in history over a period of 11 weeks: Western States 100, Vermont 100, Leadville 100 and Wasatch 100. There is generally three weeks between each event with only two weeks between Leadville and Wasatch. So in June 2012 I moved from Australia to the U.S. for the summer to race the Slam. Finishing The Slam is winning enough, although I was fortunate enough to place second overall and was the first Australian to complete the series. It was a grueling 11 weeks where I learned a lot about myself and my discomforts, as well as my boundaries and capabilities. During the Slam I stayed with Morgan Murri of Pagosa Springs, Colorado. We had met at Marathon des Sables in 2008 which was the same time that Morgan founded a charitable fund called GECKO (Giving Every Child Knowledge of the Outdoors) that staged outdoor events raising funds for GECKO programs and scholarships. GECKO was growing quickly and Morgan needed some help. Over the summer we hatched a plan for me to join him in this exciting venture. In 2013, my wife Kirsten and I moved from Australia to Pagosa Spring to pursue a lifestyle of mountain living and continue life outside of our comfort zones. I joined GECKO and took on the role of Race Director for the event management side of the organization, as well continuing to train and coach athletes from around the globe. Of course aside from trails and continuing with my running, living in a Colorado mountain town meant I became immersed in the ranching and horse culture. I have always had an affinity for horses, ever since I was a kid. Every opportunity I had, every birthday I could convince my parents, I would go horseback riding. I rode as much as I could whilst living in Australia too. Then when I raced the Grand Slam of Ultrarunning I learned about the history of the Western States 100 mile endurance run and its relation to the Tevis Cup and endurance horse riding. The Vermont 100 (the second race in the Slam) also happens to be run on the same day as the Vermont 50, 75 and 100 mile endurance horse ride – so I was able to experience firsthand what the ride event looked like. It was the most exciting feeling to be on course with super-fit horses. As a runner, it looked and felt as though the horses shared the same enjoyment of being out on the trail doing what they do best. Upon moving to Pagosa Springs it became apparent that the equine community in town and the region was huge. In fact, it’s probably more extensive than the running community. I was really excited as I knew I could access the support I needed for my new direction. I started taking note and networking and through a series of meetings and friendships locally I set my sights on the sport of endurance riding and completing the 2015 Tevis Cup. Having raced solo extensively over the past number of years, a racing partnership was going to be a whole new way of thinking. It was no longer all about me before, during and after the race; I now had a relationship to nurture and develop on this journey: a relationship with a powerful, athletic creature with a mind of its own. The concept of providing support and maintaining the best interests of a partner to get through 100 grueling trail miles really appealed to me. I am hoping that through my experience and passion within the sport of endurance, I have something to offer an equine partner. I have immense respect for the 100 mile distance, but it’s not intimidating because I’ve done it human-powered many times before. This gives me the courage to be 100% focused on my horse's well-being and our partnership on the trail. That being said, this experience has flung me out past anything I know, and the learning curve so far has been vertical. I am so far out of my comfort zone I can barely glimpse its edges. What keeps me moving forward at this point is the extreme generosity of the endurance riding community, who have made themselves available as mentors to guide me daily through this overwhelming new world. Erica and Mark Devoti, Garrett Ford, Rusty Toth and Kevin Myers, Parelli professional and good friend Terry Wilson, Parelli president Mark Weiler and many others from Parelli Natural Horsemanship, Christoph Schork and Tennessee Lane. Whilst I understand the dynamics of what is required to get to my goal, I have no real experience with horses or horse ownership. Each day I climb a vertical cliff face of learning. I became fully immersed in training for my first endurance horse ride – whenever that was to be. If that concept was not hard enough for someone with no equine background, it was made slightly more challenging living in the mountains dealing with icy road conditions, snow dumps and frigid wintertime temperatures. I am perfecting the skill of trailering a horse, sometimes two (which is two steps forward, one step backwards) as well as how to efficiently boot and suit my guy in pretty quick time before a ride. I learned the art of tailing. I’m still learning the intricacies of nutrition and metabolic symptoms. I learned about heart rates for horses, different recovery rates, and how my ability to run a few miles with the horse significantly helps that rate of recovery. As I’ve already mentioned some great teachers and mentors have made and continue to make all of this possible. However the greatest teacher of all so far has been Sonny, an 18-year-old Arabian gelding who has allowed me to explore, experiment and give me the latitude to develop. Sonny has the patience of a saint and the enthusiasm of a child. In April this year I attempted my first limited distance (25 mile) ride at Antelope Island in Utah. I borrowed a seasoned campaigner called Gus from the ride manager, Jeffrey Stuart. It took a while for me to get into the swing of things, but after the first six miles, I was hooked and happy with my choice of new sport. It was a classroom day, with Jeff sharing his knowledge of the trail and all things endurance-related. I was fortunate enough to be loaned a second horse for the following day in which I completed my second ride. After that weekend I was definitely not disappointed with how things had gone. Three weeks later I was signed up to ride my first 50 mile ride at the Mt. Carmel XP in Utah. My plan was to ride four days, 50 miles per day. I leased horses from Christoph Schork and his Global Endurance Training Center and Tennessee Lane from Remuda Run. My learning curve was almost vertical. I was exposed to a faster-paced ride on an experienced horse from day 1 on technical trails. Day 2 was getting Stolis Hot Shot through his first 50 mile ride safely. The pace was surprisingly fast given it was Stolis' first 50. By the end of day 4 I was totally fatigued and super happy with how the ride had gone. I was packing up to drive home when I was subject to some peer pressure to stay and ride a fifth day. I had no real argument as to “why not,” so I stayed and completed a fifth day – 250 miles in five days. I had an absolute blast and have to thank Christoph and Tennessee for babysitting me on each ride. Without their guidance, support and mentoring my experience would have been totally different, and I don’t believe that I would have gained so much valuable insight into the sport. It is now two weeks after Mt. Carmel and I have just purchased Stolis. I know that we have a fun few years ahead of us. Every now and then the idea of where I am heading, the goal I have set myself, and the ups and downs of the journey overwhelm me. It is important to have long-term audacious goals, but the trick to achieving them is to take life one-step at a time, live in the moment, focus on the NOW, enjoy the friendships and celebrate milestones along the way and what you have achieved today. More information on endurance riding is available by visiting www.aerc.org or by calling the AERC office at 866-271-2372. By request, the office will send out a free information packet to prospective members. To find out more about GECKO, visit www.joingecko.org. This blog series has the theme of Why Endurance. Daryl, Gwen, and Dennis have articulately written why we do it. Sometimes, however, even if we understand and accept the why, getting it done requires us to plot the how very carefully. Unless you are a professional, it's not always easy to pursue Endurance dreams. My purpose here is to share some strategies to help keep you, the amateur Endurance addict, on the Endurance trail as you journey through the main stages of your life, facing the various challenges and obstacles each stage can bring to participation. I entered my first Endurance Ride, a hundred miler, when I was a 19 year old college kid home for the summer. I have entered that same hundred miler, to be held in August, as a 66 year old retiree. In the intervening years, I have finished school, traveled, married, reared children, worked, volunteered, lived in a subdivision in a huge, flat valley with horses boarded out, and lived in the mountains with our equines surrounding the house. Not only does our sport of Endurance Riding welcome people of all ages; it is, indeed, a sport in which the individual can participate for a lifetime. I have learned that each chapter in a person's life will come with different challenges to that participation. I have also found that the three big necessities for this sport are time, money, and health/youth/energy. I have yet to find a period in my life when I had all three! In spite of that, somehow, due to the generosity of others or wily behavior of my own, I have been able to ride Endurance almost every year of my adult life. Many of us are passionate about this sport. The addiction plays havoc with our rational brains. The craving, the yearning, the sacrifices we will make, and the depths to which we will descend to feed the beast that overwhelms us are familiar. I want to share with you some of the strategies that have worked for me over the decades, as well as some observations about other riders. No names have been changed because not one is innocent. Extras for the May 23-25 Owyhee Fandango Pioneer Endurance Ride and CTR include a VETTEC-sponsored Welcome Wine & Cheese party on Friday evening, a Christoph Schork-led Hoof Care and Booting Clinic, outdoor café by Two Trees Catering, and Tack Swap. Food will be available for purchase in the café, and the Tack Swap fee will be $10. The preliminary estimate for the Swinging Bridge repair is $150,000. Government funds are limited so the WSTF and the WSERF are partnering on bridge restoration. Like a Phoenix, the Swinging Bridge will rise again! But it’s going to take time and money to make the hefty repairs. With your help, we can do this! The DRAWING will take place on August 10, 2014 at the Awards Ceremony for the Tevis Cup Ride, Gold Country Fairgrounds in Auburn, California. You need not be present to WIN! For the first time, the 3-day Owyhee Fandango Pioneer Endurance Ride in Oreana, in southwestern Idaho, will include a Competitive Trail Ride competition. Held this year over May 23-25, riders in both events, CTR and endurance, will traverse scenic canyons and historic trails below the Owyhee Mountains. Friday the 23rd and Saturday the 24th will each feature a 30-mile CTR, for those who which to try CTR or to qualify for the AHA Distance Nationals which will be held over the same area trails in September. The endurance riders will have a choice in distances over the 3 days of 25, 30, 50, 60, 80 and/or 100 miles. The Owyhee Fandango has been attracting national and international endurance riders since 2006 (the ride was named the Owyhee Rangelands in 2006-7), with competitors from the US, Canada, Argentina, Belgium, Scotland, Sweden, Romania, and Japan. Clinging to a four-legged rocket ship among the Pyramids in Egypt. Riding a racehorse on the Curragh in Ireland. Winning a first endurance ride in Texas. Flipping a packhorse down a cliff in California. Flying on a Lord of the Rings horse in New Zealand. Cowgirling it in Idaho. All of these serendipitous equine adventures, and more, are disparate pieces of a puzzle that have merged to create the eclectic, nomadic lifestyle that Merri Melde lives every day with horses. And none of them might have happened if she had not first met the racehorse Fred, who taught her how to fail spectacularly at her dream job. It's not the destination of new dreams but the journeys toward them that allow Melde, by chance or by divine intervention, to experience such diverse escapades and to come to know and love such magnificent horses as Harry—a fire-breathing dragon who gives her a great gift; Zayante—one of the country's best endurance horses; Jose—an Avatar and Kindred Spirit; and Stormy—The Most Beautiful Horse On The Planet. 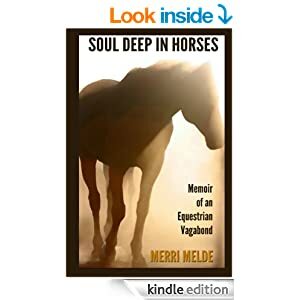 In Soul Deep in Horses: Memoir of an Equestrian Vagabond, Merri Melde paints a vivid portrait with her moving words of a unique life irrevocably entangled with horses—the beauty, the humor, the thrills, the fun, the fear, and above all, the love that goes deep down into the soul. Part memoir, part travel and horse-riding adventure book, this heartfelt narrative packed with excitement and emotion will appeal not just to horse lovers, but to anybody who has ever experienced failure and success in following their dreams, and anyone who has ever lost their courage and rediscovered it once again. 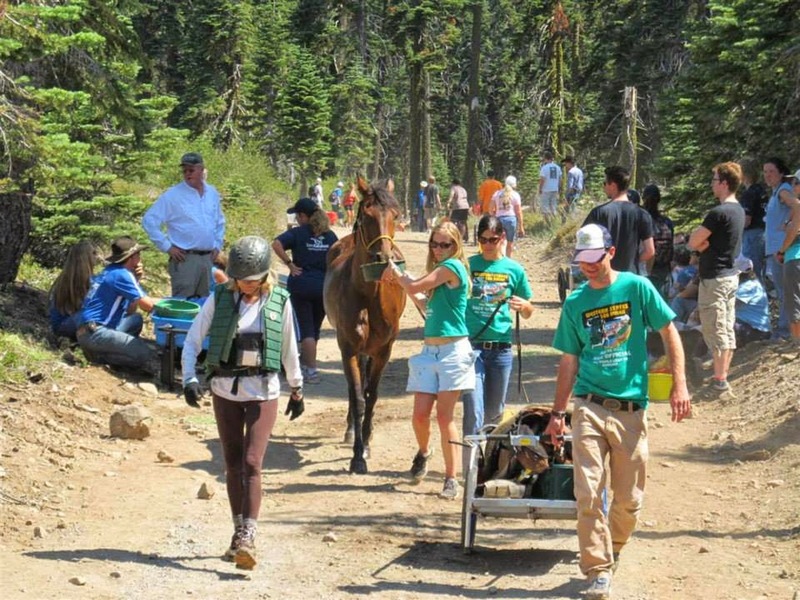 Horses and riders of all breeds and sizes spent the weekend in the Skull Hollow-Crooked River National Grasslands participating in endurance rides, trail rides and other challenges at the 43rd annual Still Memorial Weekend, formerly known as The Prineville Ride. Sandy Mayernick, volunteer coordinator at Mustangs to the Rescue, an all-breed horse rescue and rehabilitation organization based near Sisters, said she estimated about 200 people participated in the three-day event. For the first 42 years, the event was known as The Prineville Ride. When Mustangs to the Rescue Executive Director Kate Beardsley took the event over this year, she changed the name to honor Cole and Charlotte Still. It was a bitter sweet send off for a veteran marine in Surf City Thursday as he began a long journey across the country. "Sit tall in the saddle," Matt Littrell's father said as he hugged his son goodbye. The 32-year-old then hopped onto the back of his BLM mustang named "Crow," clicking to the horse to step into the Atlantic Ocean. It was a symbolic start to what Littrell expects to be a 6 to 8 month trip from Camp Lejeune, NC, to Camp Pendleton, CA. The duo will be traveling along with close his friend, Raymond Avery, and two other horses. It's all an effort to raise support and about $7 million for wounded warriors through the Semper Fi Fund, a journey that some people call crazy. The sound of pounding hooves and bugle horns fills Piedmont’s countryside at foxhunts and steeplechase races. Dressage competitions and polo matches fill paddocks. And the memory of 1973 Triple Crown winner Secretariat setting records at the Kentucky Derby, Preakness, and Belmont Stakes fills every Virginia horse lover with pride. 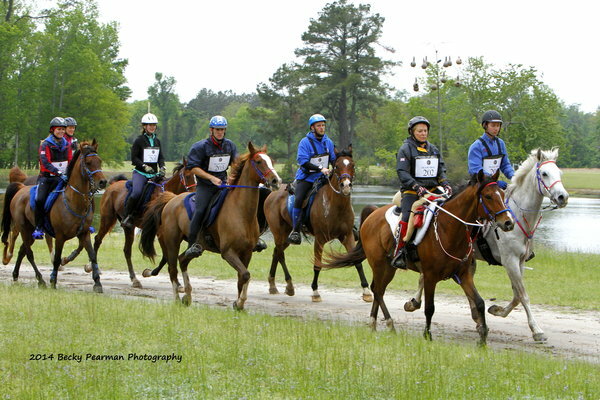 Lesser known, but just as exhilarating to participants, is Virginia’s Old Dominion Endurance Ride. For 40 years every June, riders, friends, family, veterinarians, volunteers, and horses from across America have headed to remote areas in Shenandoah Valley Electric Cooperative (SVEC), Rappahannock Electric Cooperative (REC), and Northern Virginia Electric Cooperative (NOVEC) country to tackle mile after mile of rugged trail in the “O.D.” race. Hundreds of people and horses gathered on Friday, June 7, 2013, at the O.D. basecamp nestled against a mountain in Orkney Springs, Va., near Bryce Resort. Jack Weber, O.D. president and SVEC member, welcomed everyone and went over race details with the 145 riders who entered the 100-mile, 50-mile, or 25-mile events. It seemed so straightforward: a CEI2* 120-km 2014 Alltech FEI World Equestrian Games Endurance Team Selection Trial at Broxton Bridge Planation in Ehrhardt, South Carolina, April 18-19, for U.S. riders and horses vying for a spot on the team for the August championship in Normandy, France. Endurance rides have been held over grounds of the historic Broxton Bridge Plantation (built in the late 1700's) the past several years, and it made sense to hold a 120-km event here over the somewhat flat and fast course. The horses' fitness would be determined by the trial; there would be detailed veterinary inspections pre- and post-ride; riders would hone their skills with their GPS units to judge pace; team play, crewing, trotting the horses in the vet lanes, and other things would be discussed; all "to accomplish our mission, which is to win a team medal at the 2014 World Equestrian Games," said U.S. Chef d'Equipe Emmett Ross. That was until Mother Nature had a few things to say on Friday the 17th, the day before the ride. "We were significantly disrupted by bad weather," Ross put it mildly. "When I got there on the 15th, the trails were in bad shape anyway because of the weather they'd had there all winter, followed by a big freeze. The owner of the property was very cooperative, putting some bulldozers on the trail to remove all the fallen trees. There was still some work that needed to be done, so I immediately decided to create one loop and run it several times to make up the 120 kilometers." The one-loop plan seemed a good fallback solution and all was set for the start of the trial Saturday morning - until it started raining Friday afternoon, and it didn't stop for 12 hours. The pre-ride vetting had been squeezed in Friday morning - right before the rain began, but as the day continued wet and dismal, (some 4 inches fell in the 12 hours), Friday night Ross called his 17 riders (14 rider applicants, with 3 proxy riders) for a meeting. Since the idea of the qualifying trial was not just to race 120 kilometers to determine the fastest horses and riders - particularly over a sloppy course, thereby risking losing a few to serious lameness - Ross suggested they reduce the trial distance further, and postpone the official event until Sunday morning (hoping the rain would indeed stop); and Ross would come up with another alternative trail. The riders were all in good spirits despite the pressure they all felt; and after comments and questions, they all agreed at 10 PM that night to wait till Sunday to ride. "Everybody made significant changes to their schedules," Ross said, "and they hung around, and we ended up having a very good event." What was supposed to be the Saturday night post-ride southern dinner became the pre-ride dinner for close to a hundred people - staff, riders, crews, and helpers. Everybody dressed up for a real unique southern meal; and finishing awards - crystal vases - were given out. "I think that's the first time anybody's had a finishing award before they even finished the ride!" Ross said. "People were in good spirits; it was just fantastic." The trial began at 9 AM on Sunday. The weather turned out to be clear and cool - mid-50's to mid-60's during the day - and beautiful, with the trails drying out. "It was pretty much a canter all day." Ross divided the riders into two groups, and gave each group a speed range to achieve. "When we go overseas, we're always racing in big groups of people, which we don't do here in the States. So on each of the three loops, I gave them a speed range so they could learn how to use their GPS units better. The second loop I gave them a higher speed range, and the third loop was even higher than the prior two." The course wasn't a "technical" course, though riders did have to watch their footing on some boggy areas, while still maintaining the rhythm and speed Ross set for them. "'Technical' wasn't the goal. I know we can ride technical." It turned out to be a highly successful trial despite the weather; and while the horses and riders can now rest a while, the selection process continues for Ross and the Team Selectors (Susan Kasemeyer of Tennessee, Linda Howard of Utah, and Carol Giles of Oregon), and the Veterinarians (Dr Ann Stuart of North Carolina, Dr Ken Marcella of Georgia, Dr Catherine Kohn of Ohio, and Team Vet Dr Dwight Hooton of Colorado). They will look at their notes, analyze performances, and review interviews with each rider, and will then rank the riders. By June 24th, the Nominated List of the top 10 horse/rider combinations must be submitted to the Organizing Committee in France, which cannot be changed. The Endurance Championship at the Alltech FEI World Equestrian Games will take place on August 28. Ross will continue to work with the 10 combinations, then ultimately take the top 5 to France on August 12 or 13. "Prior to the [trial] event," Ross recounts, "we had 1 or 2 people that were unable to continue due to some mild veterinary issues, so that took them out of contention, and that kind of disappointed me; but we're going to have a strong group to pick from. Everybody who will go [to France] will have earned a position on the team. And they will all meet the criteria that I think is necessary to bring back a medal." The USA team finished 4th in the World Endurance Championship in 2012 in England, just missing the bronze medal. "This year we're going to take an even stronger team, and I'm really confident - not hopeful, but confident - that we'll be able to regain some of our past notoriety in endurance company." Ross has been involved in endurance one way or another (beginning with Ride & Tie competitions) since 1982, and he has been U.S. Chef d'Equipe since 2011; and yet he still learned something from the Broxton Bridge Trials. "It isn't just about a horse and a rider being able to do something. I'm certain of this: it's the character, and the way they get along under pressure. [At Broxton Bridge] we were able to look at those things as well, and I was quite pleased, actually. You bring together a lot of highly competitive people, they're all trying to make a team, it's not always easy." 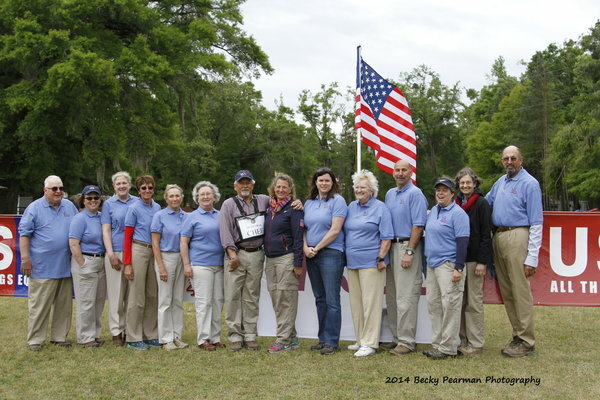 It isn't always easy, but with the depth of talent aiming for the 2014 World Equestrian Games Endurance Championship, the U.S.A. is poised to accomplish their goal of standing on the podium in France in August with a team medal for the first time since 1998. Click here for a horse/rider list.